To start, the saffron flower possesses a soft lilac beauty, but red and yellow dwell in its threads. Saffron photos by Tara Dourian. f you’ve been to Iran or Spain, you’ve probably had saffron in traditional rice dishes, painting your polow or paella. Anywhere else, it’s usually found in the quite-pricey spice stand of your local market. It fools you: you wouldn’t think its red thread could stain your fingers a deep yellow. In fact, the Arabic origin of saffron literally translates to “will be yellow.” You could use it to dye your t-shirts or your eggs. Beyond its gold-tainted sap, the spice has been considered a treasured commodity for millennia, its use dating back to ancient Persia, when its flower’s central threads were woven into textiles, seeped in curative teas, or sprinkled into opulent baths. How a flower from western Asia came to populate the hills of the Monti Iblei in southern Sicily remains a mystery. 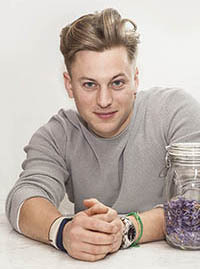 Or so says Angelo Liali, the 25-year-old co-entrepreneur behind NOTEdi Zafferano. 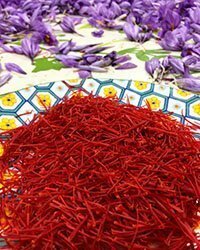 The company, which recently expanded, focuses on the small-scale production of saffron in Giarratana, Liali’s hometown of 3,000 inhabitants nestled in the Sicilian province of Ragusa. Handpicked saffron stigmas collected after a harvest. All sorts of legends trace saffron’s voyage through the Mediterranean and into Italy. Wall paintings discovered in Crete depicting ancient Greek rituals of saffron harvest are the earliest documentation of the plant’s presence in Europe. The Romans soon discovered the spice and made it into an imperial luxury item. Alas, saffron’s presence and status then dissolved along with the Empire’s fall. It was only much later, during the height of the Black Plague, that saffron resurfaced, this time used primarily for its immunity-boosting properties. Many historical narratives suggest the end of the 14th century to be the onset of Italian saffron cultivation. As the story goes, a Dominican monk by the name of Friar Santucci brought some bulbs back to his homeland in Abruzzo after years spent working for the Spanish inquisition. The flowers proliferated in their new habitat, turning the area into a saffron hub, and the first to establish a cooperative for local producers. Indeed, the Abruzzo, a central mountainous region, remains until today Italy’s leading saffron producer. While the jury is out on when the plant settled into Sicily, its cultivation on the island is considered relatively recent. According to Liali, local production took off in the early 2000s. “Not long ago, saffron production in Italy was very low, at about 80 kilograms per year — that’s nothing. But it’s started to really pick up again. Now we’re at 500-600 kilograms and it’s increasing.” Liali is among a trend of young people revitalizing and revaluing land in the area. Very early in his life, he forged an intimate relationship with his locality, one that he proudly recounts. He considers his grandfather, whom he shares names with, to be the main source of inspiration for his pursuit. Remarkably, stigmas from 200,000 flowers equate to roughly one kilo of dried saffron. Curious about the plant, he spent many weeks with his now-business partner Alessandro Muccio, scavenging the surrounding forests and fields, searching for saffron flowers. The two met as adolescents, simply by virtue of living in such a small place, and became very close friends. Aside from their mutual infatuation with the flower’s soft lilac beauty, they recognized its rare value. It was as if, at that moment, they shared a vision. Soon, they began to experiment with growing both traditional and wild varieties. Wild saffron (Crocus biflorus) is notably different from its cultivated counterpart. The flowers are smaller and much lighter in color, the stigma threads are of a yellow-orange gradient, and the aroma is more fragrant. Oh, and it also requires a lesser quantity to poison you! Just like many medicinal plants, saffron is toxic when ingested in copious amounts, no matter the variety. Harvesting wild saffron is also more laborious. “It’s about ten times the work of cultivated saffron, because the stigmas are really small,” added Liali. In business terms, it just wasn’t cost-effective. Angelo Liali: ” I started to cultivate all kinds of plants with [my grandfather] and was fascinated. Photo courtesy of NOTEdi Zafferano. Since NOTEdi Zafferano’s foundation in 2014, cultivated saffron — Crocus sativus — has been their product line’s focus. The company’s name translates to “a pinch of saffron”— a quantity seemingly added to many local Sicilian dishes like arrancini and pasta alle sarde. But obtaining that pinch is a tedious endeavor. Mid-autumn every year, as flowers bloom for barely just a two-week interval, Liali and his partner rally friends and family members for what becomes a collective effort. 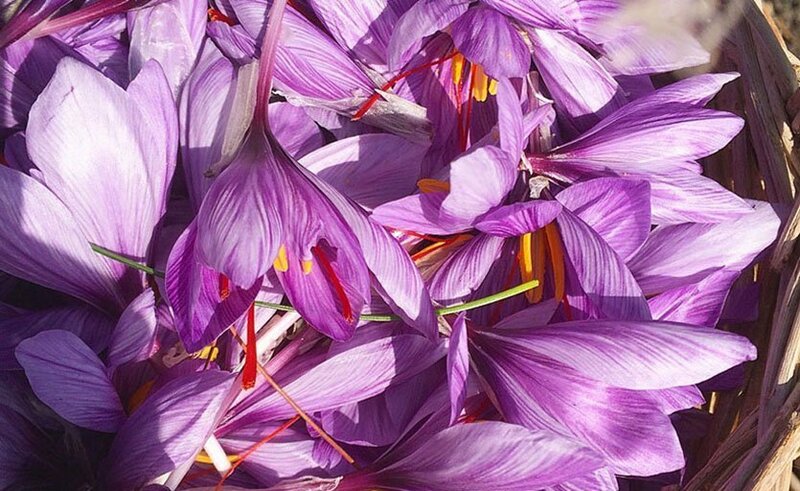 Harvesting saffron is a lengthy, delicate task — three red stigmas are hand-plucked from each barely-opened flower. And for maximum quality, the stems need to be dried shortly after extraction. Remarkably, stigmas from 200,000 flowers equate to roughly one kilo of dried saffron. Despite its unbalanced labor-quantity ratio, saffron is a remarkably generous plant. It is biologically sterile, relying on bulb duplication for its reproduction, not on cross-pollination. Bulbs multiply by copious amounts every year, and many producers like Liali sell bulbs in addition to powder and dried threads. Saffron’s particular physiology is such that any changes in its genetic makeup are attributed to place-specific growing conditions. Although the spice is far from being native to Sicily, analyses show that NOTEdi Zafferano’s bulbs have adopted local characteristics from Giarratana’s terrain over time. Sicilian ground generally provides a favorable habitat for not-so-fussy saffron: low rainfalls, lots of sunlight, well-drained clayey soil. “Perhaps the proximity to warm sea air and fresh mountain breeze adds a local bonus value to the quality,” said Liali. For saffron producers in Sicily, a key obstacle seems to be the general tendency for business to be kept within the island, rather than to branch out. There exists a gap between the excellent quality of the product and the promotion of it. However, holding a zealous and innovative spirit, Liali has vast ambitions to celebrate Sicilian saffron and make it shine.